College of Business students analyze retail and financial data provided by Fanatics for use in the classroom. 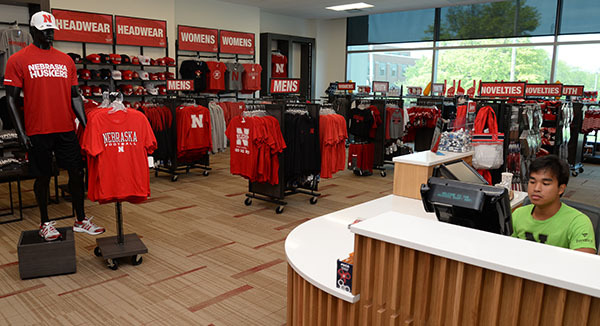 Shawn Eichorst, athletic director for the Nebraska Department of Athletics, believes the store’s visibility in the College of Business will continue the momentum built between academics and athletics at Nebraska during the past five years. Working with Executive Vice Chancellor and Chief Academic Officer Donde Plowman, who is the former dean of the College of Business, Eichorst helped implement a partnership highlighted by a new master of arts in intercollegiate athletic administration. The Huskers Shop adds another layer of value created by the pairing of athletics and business. Rob Simon, associate professor of practice in marketing, brings professional retail experience to his new role as Huskers Shop faculty advisor. He worked with a six-member student management board, along with Fanatics, who own the merchandising rights for Nebraska athletic apparel, to get the shop open. He sees the integration of the shop as a transformational addition for how students learn in the new building. Shawn Eichorst (center) worked with Donde Plowman (right) to create partnerships between athletics and business to build student opportunities. The ongoing relationship between the College of Business and the Nebraska Department of Athletics, makes the project more viable, according to Simon. He believes the “Big Red” brand goes a long way. “Husker athletics is a well-known brand that gives us immediate recognition. It lets us grow the business quickly and gives the store instant credibility. Fanatics has the expertise, access to inventory and is also a well-known brand of its own. There is no way we could have gotten the store put together in such a short time frame without the help of these partners. They both bring a tremendous amount of access to resources we otherwise wouldn’t have,” said Simon. The College of Business also partnered with the College of Architecture Department of Interior Design to help design and best utilize the store’s space. Sixteen interior design students presented eight unique designs which were incorporated into the final plans for the space. Megan Nelson, a senior marketing major from Newman Grove, Nebraska, helped with the planning as the marketing officer on the student board. She wanted to be part of the operations to support her college and enhance her future career. An additional challenge for Nelson involved planning for a store that did not physically exist for long before the grand opening. She found creative ways to get things going even before the shelves were stocked. Rik Barrera, associate dean of student services and chief operating officer at the College of Business, talks about the Huskers Shop to students. “I worked with the Communications, Marketing and External Relations staff at the College of Business to execute a presence on social media. Facebook, Twitter and Instagram will be an imperative part of the store's marketing efforts. My work is part of an independent study class with Professor Simon, so I got to see the marketing designs that Fanatics, Nebraska Athletics and the College of Business team worked on,” she said. Simon said the main focus of the store is on the student experience as well as the many partnerships that make the store possible. “We want to maximize student exposure to business in many ways, so they graduate from college with experience working in partnership with a for-profit business. We also want to make it a great experience for our partners, which should only enhance student participation over the long haul,” said Simon. The Huskers Shop, which is located on the northwest end of the first floor in Howard L. Hawks Hall, is open Monday through Friday 10 a.m.-6 p.m., and home game day Saturdays. For the first game, shop hours are 3-10 p.m. Check website for future game day hours. Visit the Huskers Shop online at http://business.unl.edu/about-us/huskers-shop/.